A Little Monday Story about Kindness . . . 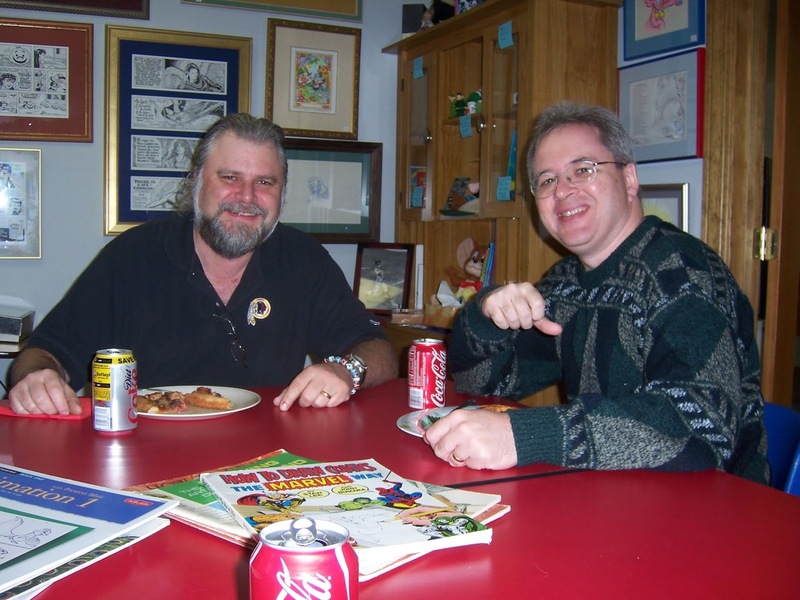 In 2007, Karen and I toured a bit of New England, which included a stop at the then-studio of cartoonist Guy Gilchrist in Connecticut. Although we called on Guy on his day off, he couldn't have been more generous, meeting us at his place with pizzas and talking about comics for a couple of hours. He's a real raconteur, and the kind of guy who took a piece of art off his wall and handed it to me because I effused about how much I'd admired and studied the artist. With Guy in his Connecticut studio in 2007. We kept in touch online. 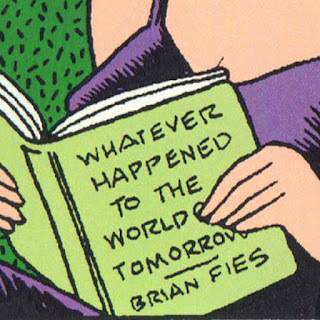 In April 2010, Guy gave me a nod in his comic strip "Nancy" when he drew my book "Whatever Happened to the World of Tomorrow?" in the lap of Aunt Fritzi! I asked Guy about getting the original art but he said it had been damaged and wasn't available, so I framed that day's "Nancy" cut from the newspaper and displayed it proudly on my wall, until that wall and everything else burned down a year ago. A few weeks ago it occurred to me that "Nancy," which in 2010 was syndicated by United Features, now somehow belongs to Andrews McMeel Syndicate (I don't follow the business shenanigans), the same folks who run GoComics.com, which currently hosts my "Mom's Cancer" and "Last Mechanical Monster" comics online. 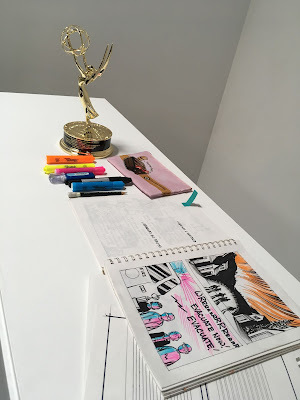 And that my editor, Shena Wolf, also edits "Nancy," which is now done by Olivia Jaimes after Guy left the strip earlier this year. I wrote to Shena asking if her files went back eight years, and if it wouldn't be too much of an imposition, she might be able to dig up my old "Nancy." I hoped maybe she'd email me a decent-resolution JPG or TIF I could print out and frame. Instead she sent me this beautiful print on fine paper that will look awesome in my new someday-studio. So today I'm the beneficiary of the original kindness of Guy, who shared his time with me, then a few years later put my book in his strip . 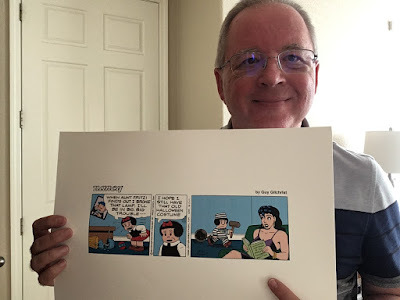 . . and eight years later, the kindness of Shena and the Andrews McMeel print team, who found that strip in their archives and sent me a print of it. I appreciate that unlikely chain of kindnesses almost more than the strip itself. I'm also loaning them Emmy. We debated including her. The museum has the same sensitivity I have: our community's disaster is nothing to celebrate. "Hooray, I got an award, sorry everything burned down!" I told them that to me the Emmy represents the larger world honoring our stories (not unlike the exhibition itself), and I'd trade it for my house in a second if I could. So I think they're going to show it with a little placard that says exactly that. From what I just saw in early set-up, it's going to be a great exhibition. Opening reception is this Saturday, and it'll run through January. --First Street Napa Gallery, Napa, “Art Responds: The Wine Country Fires,” Oct. 10-Dec. 15. All these places are run by talented people who are passionate about capturing our history and telling all our fire stories. Luckily, I had enough pages to go around, barely. If you're in the area, take a look sometime in the next couple of months.